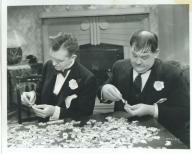 We at The Wax Apple have sought to uncover the names of (and, where relevant, the composers of) all of the Laurel and Hardy film scores. With the invaluable assistance of staff member Richard Finegan, we will be publishing the music cue sheets in their entirety via the website or the printed version of our magazine. Some of the listings will also be accompanied with interesting background information about the various tunes. Herewith, the music cue sheet for Me and My Pal, Laurel and Hardy’s 1933 short in which they make a futile attempt to work a jigsaw puzzle while preparing for Ollie’s impending wedding. 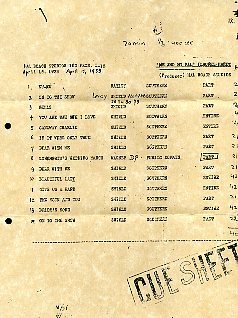 The cue sheet is designated to production L-13 and dated April 15, 1933. All songs composed by Leroy Shield unless otherwise noted. Interesting to actually know the titles of these songs.